It is becoming inceasingly apparent to me that many minor hockey teams are coached not just to hit but to hurt. I have previously vented (in this space) about how ludicrous it is that contact starts at 11 years of age in minor hockey leagues in Ontario. Some other provinces allow contact to start at 13 years of age. What? Are 11-year-olds here different from 13-year-olds in other provinces? Please, some higher more intelligent power explain this logic to me. Why in the world is it not the same across the country and why, oh why does it have to start at an age where their little bodies are changing every second of the day, not to mention their MINDS. 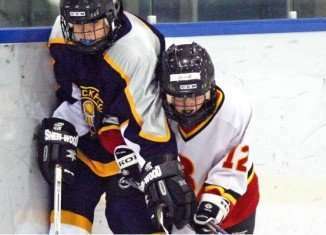 11-year-old boys and girls do NOT have the mental or physical capacity to understand the proper technique of bodychecking cleanly. Furthermore, many minor hockey coaches (mostly devoted parents) do NOT have the knowledge, experience or proper training to teach these kids how to bodycheck cleanly. Let us call it a day and take contact out at age 11 and work on providing better education to minor hockey coaches. Adding insult to an increasing number of severe injuries, refereeing (from my experience) in minor hockey leaves a lot to be desired. Most blatant penalties are not called, illegal contact eludes the referees whistle and suddenly kids who get away with these acts repeat them cause they're pretty confident they won't get caught. Get where we're headed here? One of my sons' had a tournament this past weekend and what I saw convinced me of how FAIR PLAY and SPORTSMANSHIP are acknowledged via simply lip service by many minor hockey teams. There are teams who go out there headhunting. Players who are taught to be overly aggressive, chippy, dirty and downright unsportsmanlike. “Crush her” is what one mother told me she heard the opposing coach say to his players about her daughter. Just lovely. These 11 year-olds are playing for what again? To keep their egomaniacal coaching staff happy, permanently injure another 11-year-old or to win at all costs? “Winning isn't everything, it's the only thing,” a prominent, former professional coach chirped decades ago. Well it seems in the increasingly competitive, frighteningly narrow-minded world of minor hockey, that adage is the mantra. Coaches, teams, players who are known to be exceedingly chippy, dirty, malicious in their intent and execution should be suspended. Referees who don't call penalties on obviously illegal plays (hitting from behind, excessive force, hitting after the whistle, etc) should be relieved of their duties, re-trained and re-educated until they GET IT. No child signs up for hockey to become paralyzed, concussed, permanently injured. Yes, things happen. The speed, power and various flying objects in the game invite a certain amount of danger. But let's not add to it, thank you. Fortunately, and I have no idea how, our kids have always been on teams where the coaching staff has put sportsmanship first. All three of them have played on different teams in different leagues and they've always had the experience of fair play first, skill development next and everything else after that. During a game before ours, an older team (probably 13 or 14-year-olds were absolutely dropping like flies — chippiness all over the place). Then came horror. A kid got flattened by some other kid twice his size. All is saw was that smaller kids' nose first, flat on his face on the ice. He did NOT move for what must have been a solid minute. Then as the arena held its breath, some dense father (clearly not the parent of the injured kid) said, “that was a clean hit,” when most everyone else completely disagreed. A clearly fired up mother responded, “you've got to be kidding me buddy.” I was waiting for a fight to break out in the stands. Mercifully it didn't happen. The kid groggily struggled to his feet with help. The perpetrator got 5 minutes and a game misconduct. Teams who play dirty have a reputation. No PHD required to figure that out. Most 11-year-olds can tell you that in about 2 seconds. Coaches who teach their teams to play dirty are not fooling anyone. Kids learn from what they see and what is shown to them. The increasingly violent hits in the NHL are most certainly not helping matters (Matt Cooke of the Pittsburgh Penguins again) last night, but neither are whacked minor hockey coaches who purport to be concerned, volunteer parent-instructors keeping the hockey team/league/association alive, while quietly cultivating a culture of violence in their players/teams. You know who you are. You have been outed. You should forget bodychecks and check your conscience instead. There are certainly exceptions, thank goodness, but from my perch in the stands game in and game out, year in and year out, there is a trend here and it is not pretty. Yes, some parents are living their dashed NHL-dreams vicariously through their kids. Others, are just clearly swept up by the emotion and passion that hockey evokes. And then there are others so irrational and out of touch with reality that they can justify dirty plays as “good, clean checks”. It is high time that Hockey Canada or whatever national body oversees the training of minor hockey staff — do their due diligence on who is being allowed to coach, what credentials they have and most importantly ensure the training they receive starts with SPORTSMANSHIP and FAIR PLAY first. Maybe it exists, but the message is not resonating everywhere. After that, there needs to be an ongoing check/evaluation/whatever to ensure that repeated offenders are dealt with immediately —- that includes coaches, players, parents, etc. There is absolutely no way that a fabulous sport that teaches kids so many outstanding lessons (teamwork, leadership, fairness, sportsmanship, discipline, etc.) should marred by a maniacal increasing minority of individuals — coaches, players, parents and others — who are disrespeting each other, themselves and the game.